I scream, you scream, we all scream for ice cream! Yummy ice cream colors inspired this design. Chocolate, strawberry, vanilla, cotton candy blue, and lime sherbert are all represented. The top is a traditional striped pattern. On the bottom the same colors are sprinkled about. A lovely chocolate band separates the two patterns. 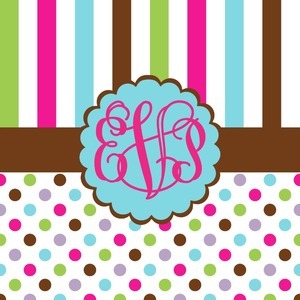 A cotton candy blue scalloped label trimmed in chocolate pulls the design together. 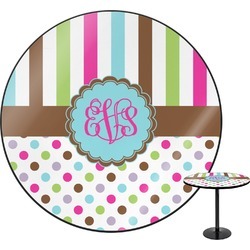 Add personalization of your choice to add that cherry on the top to this design.